Ever wondered why Reformed churches are so big on doctrine? Just look at the size of John Calvin’s The Institutes of the Christian Religion. Many tomes on doctrine followed: Francis Turretin, the Synopsis produced in Leiden, Charles Hodge, Herman Bavinck, Louis Berkhof. See if there is a copy of “Concise Reformed Dogmatics” in your church library. Concise it is, but at over 900 pages, not brief. The Reformed are big on doctrine. “Steak, not spam.” Spam: in our effluent society few may actually know what that is. It’s canned meat, the cheapest meat one can buy. It’s boiled meat scraps spiced up and pressed together in a can. You can imagine it doesn’t compare to steak, to a medium rare well marinated sirloin. Steak looks good and is good. Spam is a poor excuse for meat. We’d rather have a steak. The Reformed church, so this couple indicated, is to be lauded for the steak it serves. Steak, that’s doctrine, especially doctrine as presented in the confessions of the church. This couple figured the Reformed are to be commended for being so big on doctrine. Of course, not a couple’s opinion but the Bible decides if being big on doctrine is right. Noteworthy is an instruction Paul gave to Titus when Titus had to “put into order” the churches on the island of Crete. The Holy Spirit gave this instruction: “An elder must hold firm to the trustworthy word as taught, so that he may be able to give instruction in sound doctrine and also to rebuke those who contradict it.” Clearly sound doctrine is essential to the church! Now, “sound” in the expression “sound doctrine” can also be translated with “healthy”, both in the sense of “being in good health” and “contributing to good health”. Steak is healthy meat. Spam? Not really. Clearly a church should serve the steak of doctrine. Sometimes people leave a Reformed church because they figure it’s too big on doctrine. Such people want more experience, more sensation, less learning. Sometimes Reformed churches will water down their doctrine to keep such people (and often the steak-eaters then leave). At first, spam keeps such people happy. After all, it is meat too and it is filling. 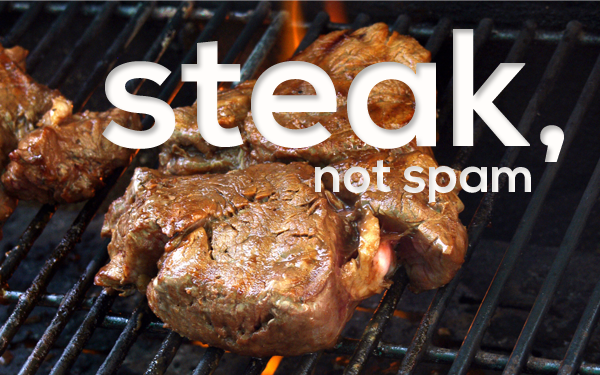 Steak is always better than spam. Enjoy the steak the Reformed serve. It’s a little harder to chew than spam, but it’s healthier by far. Be big on doctrine.